Description: Level: Industrial engineers, manufacturing systems, automation, product and process design engineers and managers, sustainable green engineers and managers, PLM (Product Lifecycle Management) engineers, IT and software developers, quality & operations managers, and others, interested in CNC (Computer Numerical Control), robotics and automation. Also ideal for undergraduate / graduate education and research. Industrial Sponsors/ Contributors include with special thanks to ABB Robotics, Fanuc, Gosiger Automation, Mazak, Mori-Seiki, Okuma, Renishaw, Rexel, Rockwell Automation, Schmalz, Schunk, phd, Sandvik Coromant, Yaskawa - Motoman Robotics, Siemens, CIMware Ltd. UK, CIMware USA, Inc., and others. 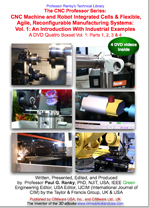 Contents: This publication is a professional quality 4 DVD video Quatro Set, covering use-cases, and some of the most important analytical, software, as well as practical industrial and research aspects and examples of CNC machines, robots, cells, agile and reconfigurable manufacturing systems. Having understood the material presented, the manufacturing systems engineering design team will have a clear concept, sound principles, and understanding for CNC machine and robot integrated cell and system designs. The series was written, presented and produced by Paul G. Ranky, PhD, the internationally known author of the first book published on the design and operation control of FMS (Flexible Manufacturing Systems) by North -Holland in 1982, as well as the author of several other publications on CNC, robotics, automation, quality and CIM (Computer Integrated Manufacturing). Dr. Ranky has designed and programmed CNC systems, robots, robotic cells, FMS, agile and reconfigurable systems for over 10 years in industry as a professional manufacturing systems design engineer, and 20 years in academia as a professor and consultant in the USA, Europe, and Asia. Part 1 introduces the basic components of CNC machines, CNC machine and robot integrated cells and systems. Offers several narrated industrial demonstrations of advanced CNC turning, milling, grinding machines and cells, as well as computer controlled flexible, agile, reconfigurable systems. Part 2 focuses on CNC machine and CMM (Co-ordinate Measuring Machine) integration, part inspection, tool setup, some CNC programming and simulation, as well as CNC multi-tasking examples. Part 3 discusses CNC laser cutting cells, robot integrated multi-tasking CNC machines, advanced robots and some exciting aerospace and other CNC machined parts. Part 4 introduces CNC tooling and a wind turbine machining case with Sandvik Coromant, some of the fundamental FANUC drive and control components of simple to more complex CNC machines, FANUC's nano CNC control, high speed smooth TCP (Tool Center Point) machining, 5 axes milling, large robot / machine tool cells, with integrated vision and automated robot tool changers, and others. System Requirements: DVD-ROM: NTSC standard def. (SD) DVD video player for TV, and/or computer. (All videos shot in HD, rendered to SD). Approximate length: Part 1=43, Part 2=32, Part 3=34, Part 4=48 minutes, in 16:9 widescreen format, also playable on a 4:3 regular screen, or any good computer screen (800 x 600 resolution, or better). Also available in PAL DVD video, in streamed digital, and Apple Video iPod and other mobile formats. HD (high-definition NTSC and PAL) formats are also available. Note, that this series has several follow-up Boxsets covering further analytical methods, USA, European, Japanese and other exciting industrial examples. Sample video clips in iPod res. : Clip-1, Clip-2, Clip-3, and Clip-4. Available in HD. Please contact us for details. Coming soon! You'll need a FAST Cable Modem, or DSL Internet connection! Mobile Device Video for iPhone, iPod, iPad, and others shipped on CD-ROM or DVD-ROM (depending on the file size). You can save these files in your mobile devices via your iTunes Library on Mac or PC. This publication, in ALL listed formats, can run from your, or our server. Contact CIMware USA to discuss and purchase a server-based license.